A desktop facsimile system, the Sharp FO-DC535 handles high-volume, high-distribution faxing and basic copying. Optional network attachments expand its functions to include e-mail, scanning, and printing. The top of this desktop machine contains the DC535’s full-house control panel. The prominent LCD display tilts from 10 to 65, with automatic energy-saving backlighting. The pseudo-QWERTY keyboard doubles for 1-touch rapid dialing, with cover letter creation, and machine status. The lower panel has your traditional 10-key phone pad and basic menu for 2-sided faxing and copying. For distribution lists and faster transmitting, the FO-DC535 allows programming up to 159 fax and phone numbers. It also can hold up to 20 personal phonebooks, each one password-protected and able to hold up to 75 programmable numbers. Combining the broadcasting feature with a programmed distribution list, one fax can be transmitted to up to 179 numbers (but no junk faxes, please). With all of these features, Sharp understands there will be times when you only want to send a single fax to a single number. With Quick Scanning, a fax can be transmitted with a couple of button presses in under 2 seconds. A speakerphone on the fax actually allows you to talk to someone before sending out or receiving a fax. If you prefer a standard phone, the back of the FO-DC535 does have a pass-through phone jack for connecting a phone without needing another wall jack. The FO-DC535 can hold up to 750 sheets of letter-sized or legal-size paper, through a 250-sheet and 500-sheet trays. For even more capacity, a second 500-sheet tray can be attached for over 2.5 reams of paper-packing capacity. With the paper and toner capacity, it’s unlikely the FO-DC535 will ever run out of supplies. But in the case of a possible paper jam, the built-in 8MB flash memory can store about 500 pages. If a sender transmits a confidential fax, it will automatically get stored into memory until a password is entered to print it out. The Print Hold function allows you to manually send faxes to memory. This option can save on paper for overnight faxes, allowing the user to filter out spam before printing, or to prevent reading of faxes without the proper security password. There is also a “Junk Fax” blacklist for up to 50 numbers. The FO-DC535 has transmission speeds up to 33.5Kbs for a 2-second transmission rate per page. Printing and copy speeds reach up to 16 pages per minute of 64-level grayscale images at 400 x 400 dpi resolutions. For single-feed faxing, original documents can be as small as sizes 5.8” x 5” up to 11” x 38”. 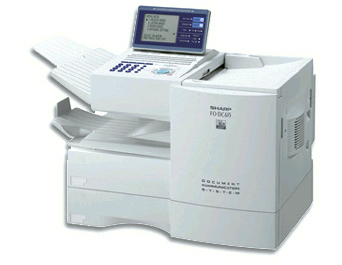 Using the automatic document feeder, up to 50 letter-size or 20 legal-size pages can be scanned on both sides. Its large paper capacity makes the FO-DC535 a fine office copier. Copying is as easy as placing the original in the feeder and pressing the “Copy” button. Resolutions of 600 x 600 dpi with settings to adjust exposure and contrast will print up to 99 copies at 16 pages per minute. You can choose if copies are to be collated or stacked. Network options for the FO-DC535 allow for expanding its features to include scanning, printing, and e-mailing. With less professional fax machines capable of handling phone services that may be on the same line, it’s surprising the FO-DC535 can not support lines with services like call waiting or call forwarding. More companies rely on digital lines for phone support, but the FO-DC535 is not compatible with digital telephone systems and must be connected into traditional analog phone line. 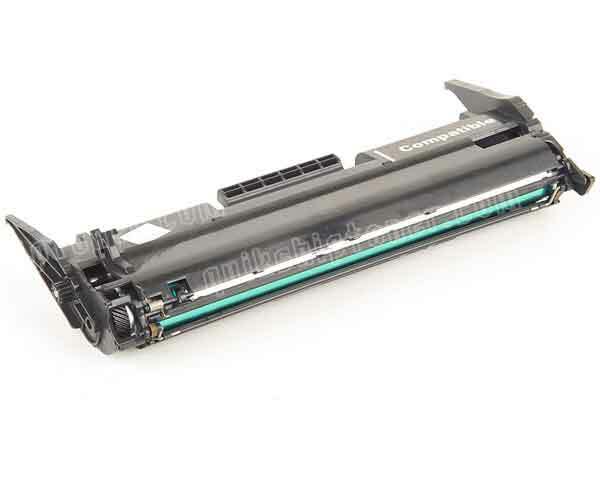 Review it: "Sharp FO-DC535 "
Indicators on the Control Panel will indicate when 100-pages are left for the toner, 1,000 pages remaining for the drum before replacement. 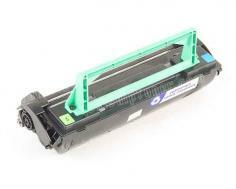 The drum and toner can be easily accessed through the top cover. Sharp ships the unit with a 50% full toner cartridge that will last for about 2,000 pages. 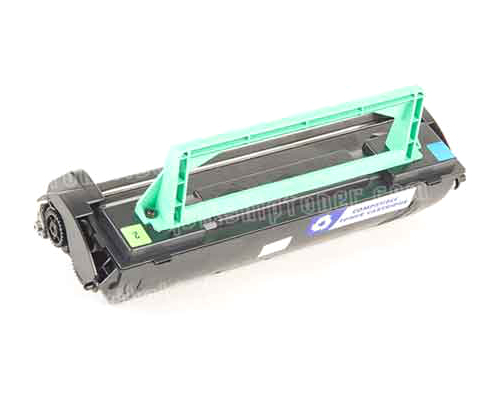 Unless you plan to go through 4 reams of paper in a week, you will have time to order a full toner cartridge before the starter cartridge runs out. Having the drum as a separate component reduces the overall consumables cost. The drum is good for 20,000 pages, or 4 cases of paper.